In October of 2016, we launched a pilot of our EXCITE Transformation for Libraries to teach library leaders the 21st Century skills required for collaboration, innovation, transformation and entrepreneurship. This work was conducted in partnership with Connecticut State Library’s Division of Library Development and funded by a grant from IMLS*. 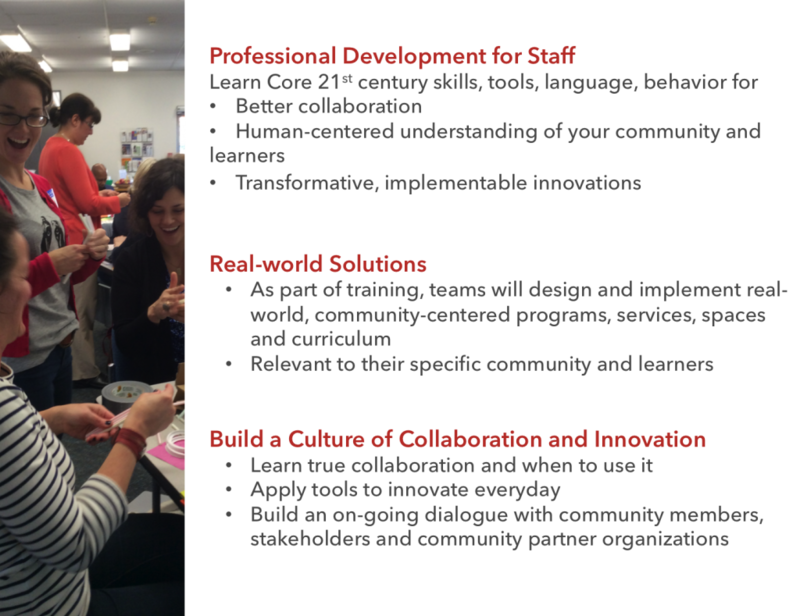 The program teaches librarians how to adopt the character of collaborative innovators, how to reach out through human-centered research to understand their community members on a deeper motivational level, how to use those insights to imagine AND develop transformative programs, services and spaces that engage the community in ways that are meaningful and exciting to them. There are three main outcomes of this exciting, immersive program. 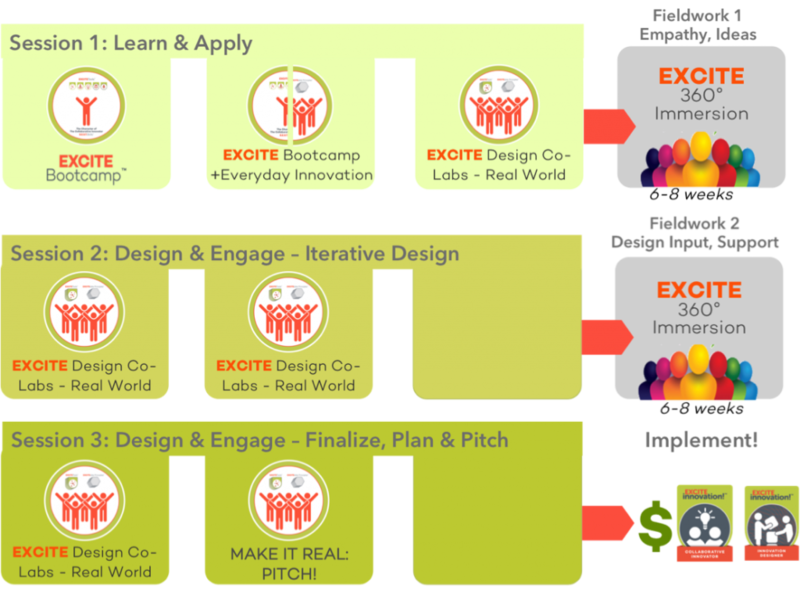 The full EXCITE Transformation program takes place over 5-6 months and involves a series of in-person, collaborative, immersive sessions with other libraries, followed by field work, coached by Innovation Builders, that the teams do in their own communities, with community members, key stakeholders, other staff and community partners. 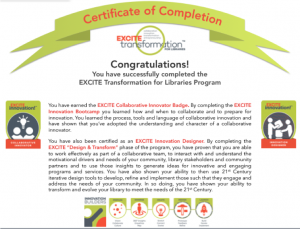 Above are graduates of the EXCITE Transformation for Libraries pilot program, conducted in partnership with Connecticut State Library’s Division of Library Development. This was taken after they made successful pitches for their programs to an expert panel of library leaders, entrepreneurs and business leaders. Each team was awarded a seed grant by the panel to implement the programs they developed. 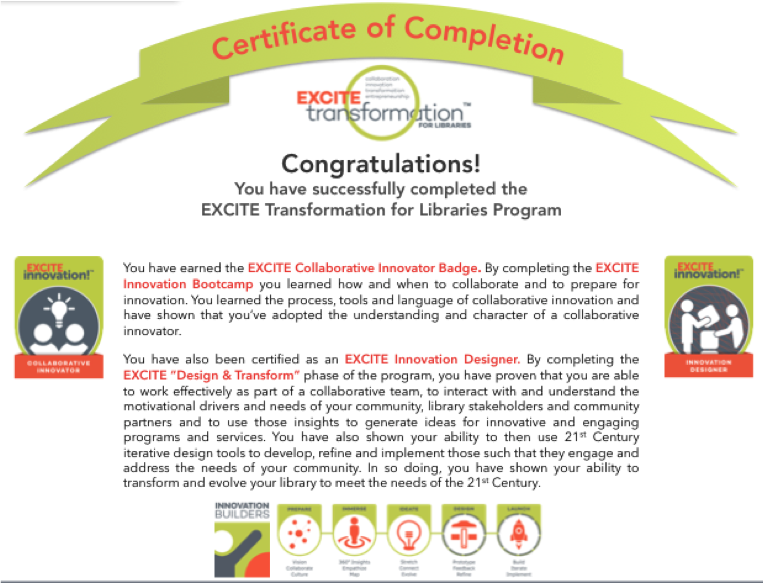 Each were awarded two digital badges: the Collaborative Innovator Badge and the Innovation Designer Certification. 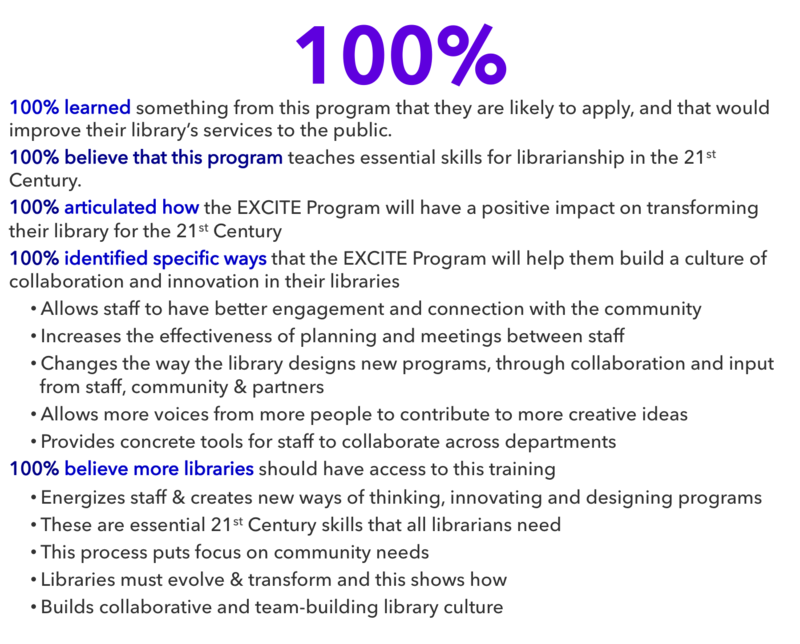 Hear about the impact of our work, from participants of the first EXCITE Transformation for Libraries pilot, conducted in partnership with Connecticut State Library’s Division of Library Development, and funded through a State grant from the Institute of Museum Library Services. After the video, scroll down to read feedback we received from participants throughout the program.